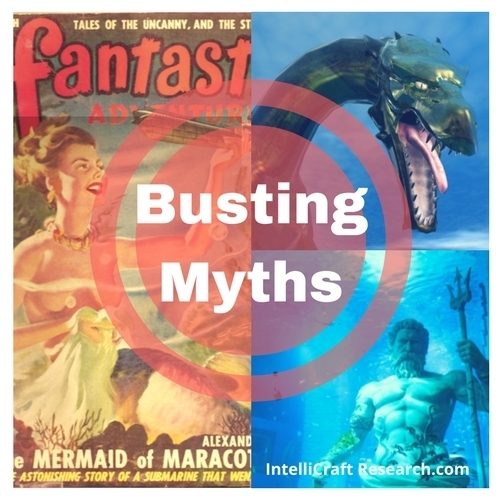 So, I busted some myths for you and covered what content marketing is – and what it’s not – and I started talking about why this new, improved, here-to-stay kind of marketing is important for your library’s efforts. Maybe you think content marketing is just businesses, for orgs selling actual things? It’s about creating and supporting relationships, building engagement, building trust and credibility. You do that by talking. 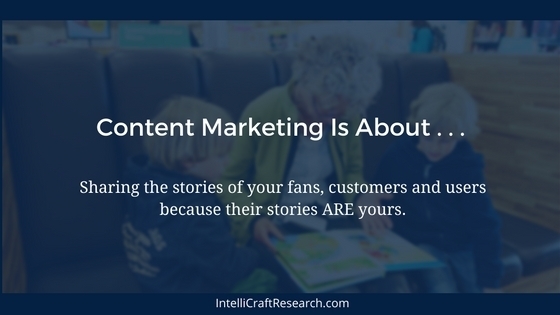 By telling stories – YOUR stories, the stories of your users and patrons, of your fans, your supporters – because THEIR stories ARE your stories. Maybe you wonder why you need to care about the latest marketing fad – it will probably go away soon. Nope. It’s not really ‘new’. In some ways, content marketing is as old as humans trading or selling things. We told stories to get rid of something, trade for something more valuable, or listened to stories and forked over coins, shells or whatever the currency of the day. Content Marketing now is just a newer form of that storytelling for trade. And If Leo Burnett and David Ogilvy preached its core concepts back in the “Mad Men” hey-day, era of advertising, it isn’t new. But it is being newly applied, written about, taught and spread like a viral wildfire. Heck, John Deere launched a custom publication on teaching farmers to farm better (and more profitably) back in 1895 [The Furrow]. It has become a bit of content marketing legend and lore showing that ‘old’ ideas live on in new ways. It’s still being published – now available on your tablet, Facebook, Twitter and more. Maybe you still hope that people will just take your wonderful, creative library outreach ideas and run to sign up or just show up. Your posters and flyers are out there, there’s no need to actually talk to you, read your site, or work with you directly before deciding to act. And if they run and show up without needing any more info – well, great! But that means they were already super fans and users and didn’t NEED to be marketed to. The ones you are still trying to persuade? To win over? Yeah, they need more info, more content, more direction. Nope, it’s about building trust over the long haul. Maybe not. It takes time, effort, manpower and consistency to really work. But it doesn’t necessarily have to be pricey and it’s not like buying expensive ad space with unknown returns. No, nope, and no way. Good, targeted, quality content helps your SEO for sure – but there are not magic SEO methods; social media is key to bringing attention to your awesome content and traffic back to your site; and a blog is just one way to create and share content for marketing, but it’s by far not the only way. You thought you were done after you you wrote, took a pic, snapped or shot that video? Remember ‘Field of Dreams’ and ‘if you build it, they will come’? Yeah, that doesn’t work in real life. You have to promote your content and your org, you need to interact, you need to plan, you need to measure and no you can’t throw content into the internet wild and hope good things happen. Need some more proof, from more experts? See this CMI article. 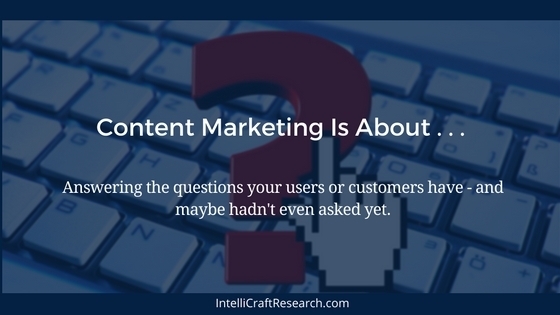 Why else does content marketing REALLY matter? What does it even DO? It’s about answering the questions people are really trying to ask when typing into a search engine. You want to be the answer to their search and research, right? Libraries are the HOME of research and question answering! Don’t we want to show up as the go-to resource WHERE our people are – online, searching?! It’s about helping a customer who is trying to compare options or make a smart decision between similar services, features on a product or local businesses. 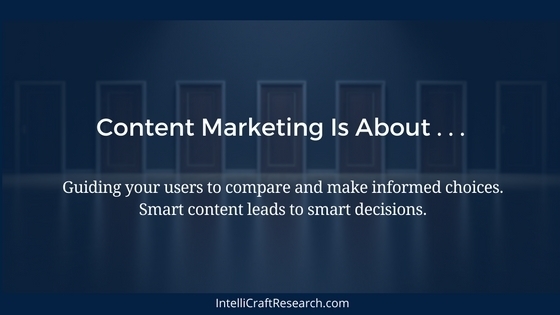 Smart content helps make smart decisions. Libraries are full of smart content and resources to help our patrons make better informed decisions. But they need to know it’s there and how to access it, in the kinds of terms THEY use and look for – not necessarily the ones we as library pros use. It’s about helping voters make informed decisions. For library funding. For community infrastructure. For the ‘small’ elections as well as the big ones. It’s about giving resources and information to help library patrons advocate to their town councils, county supervisors, state representatives and Governors about funding to support increased services. It’s about social causes informing their donors where their money is going, case studies and examples of real people, real lives affected and changed with donations. It’s about libraries using case studies and examples to show what happens to those donations to the Friends group, to proceeds from the book sale, to what makes a ‘good’ donation vs. the old, unusable books and why we weed them, turn them into book art or have to trash them. (and speaking of weeding – there’s a jargon term that probably brings up the wrong image in a patron’s mind) What terms can we use instead when talking to our patrons? How can we SHOW them why such work matters and is a vital part of library-building and resource maintenance? It’s about helping your loyal library users and fans stay engaged with your library’s brand and learn about new services, new programs or upcoming events. If they really like what they get from you, if they feel helped and valued, then they’re much more likely to turn into vocal advocates in the community for your organization. It’s about giving freely, generously of your skills, knowledge and expertise. We do this every day as librarians – it’s what sets us apart from so many other organizations and professions. But it also means knowing that giving away resources and ‘knowledge’ is only the start – because like the 1980s ad/tagline, “knowing is half the battle”. People still have to apply that knowledge. That takes time, effort and experience. Only you can really show them, teach them and lead them on that path. The ideas by themselves won’t be enough, and they’ll come back for more. So it doesn’t matter if you’re a big business selling shoes to consumers, a small business selling research services to other businesses, a local nonprofit saving animals, or a public library helping patrons find jobs or local entrepreneurs find their niche – I am convinced content marketing is the most effective way to build successful marketing today. Every one of those types of organizations can – and must – create content that their specific audience benefits from. This means you too libraries! And if your audience benefits, YOU benefit. 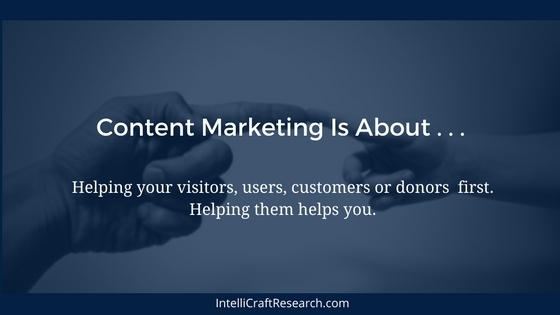 Content builds trust, credibility, authority … and eventually converts into dollars (or donations, funding, support, advocacy, attendance, and of course, word-of-mouth). There isn’t an organization out there that can’t benefit from that! 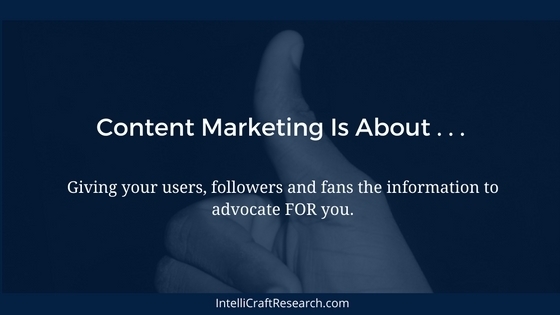 I firmly believe you and your library need to care about content, and using content marketing properly, for your library’s efforts to be the most effective, efficient and successful they can be. I’ve written about it, given presentations and even webinars for national library organizations. And I will do so again and for any group or library that lets me talk about my pet topic! If you agree that content marketing is important for libraries, email or tweet and let me know. Let’s talk!